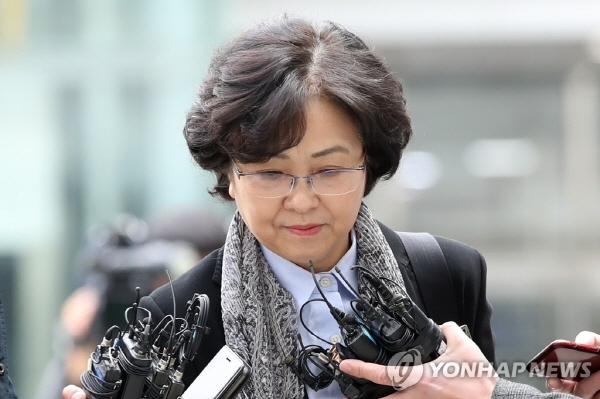 The Seoul Eastern District Court ruled that Kim Eun-kyung, who headed the Ministry of Environment from 2017-18, presents no risk of flight or destroying evidence given her current status as a retired public official and the prosecution appears to have obtained sufficient evidence. Kim stands accused of pressuring several heads of public institutions affiliated with the ministry to step down and disadvantaging one of them for not complying with the demand. "I will do my best to explain to the court and will wait for the judge's decision," she said earlier. The presidential office Cheong Wa Dae has defended Kim Eun-kyung, insisting that decision-making on who should be, or should not be, appointed as top officials is well within the power of a minister.